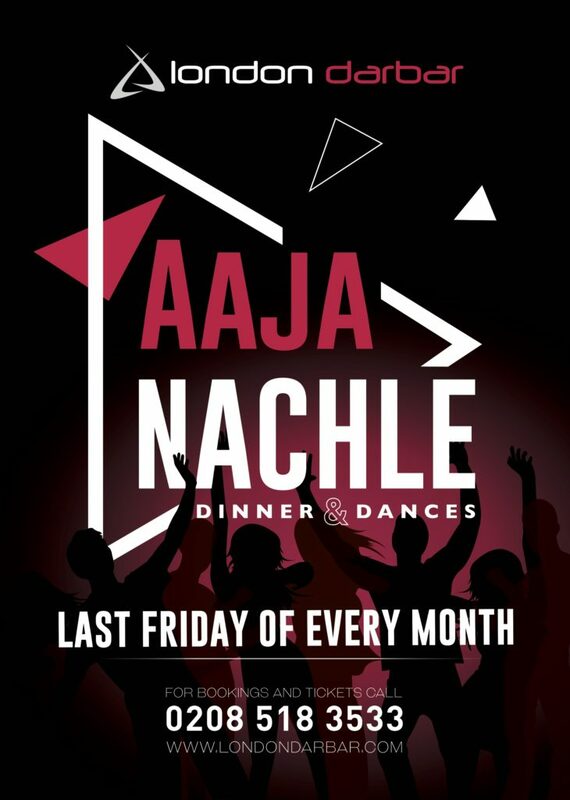 Aaja Nachle is London Darbar’s trademark ‘Dinner & Dance’ event occurring every last Friday night of the month. This has been running successfully since 2008 and has honed its position as the most celebrated dinner and dance event in East London & Essex and continues to grow every month. Come along with your family and friends and indulge in an evening of sheer bliss with great food and full-on rocking music by our DJs. We also have a bar where you can buy beers, wines, spirits & champagnes. It’s an extravagant night out featuring a 4 Course meal with mouth-watering cuisine consisting of the finest Indian & Punjabi dishes with unlimited soft drinks. This is a guaranteed guest list event and sells out fast, so book your tickets now and come shake a leg with us at Aaja Nachle. 4 Course meal with mouth-watering cuisine consisting of the finest Indian & Punjabi dishes with unlimited soft drinks. We serve a variety of vegetarian and non-vegetarian dishes. Full-On Rocking Music By Our DJs. Last Friday of Every Month. We do have special events on also during the year. Visit our website to see our event dates. We operate strict timings so please be on time to enjoy the full experience. We Want Our Parties To Be Awesome So We Ask Guests To Really Dress To Impress! Therefore, To Maintain This We Operate A Strict Dress Code At All Times. We Do Not allow casual wear which includes hooded jumpers, t- shirts, jeans or trainers. The management also reserve the right to Refuse Admission if they feel you are dressed inappropriately for the event. Large Group Bookings are always welcome. Please book your tickets together using one card payment (single transaction) or you could be sitting on a different table. If you are a part of a group booking then you need to email us your names and how many you are , Our tables are either 10 or 11 seats and we tend to share tables. We Operate A Strict Door, Dress Code And No Refund Policy.